If everyone in the Greater Lehigh Valley spent $10 per week on locally grown food, it would generate $207 million for our local farms and $93 million for local businesses. In total, it would add an extra $300 million to our local economy. 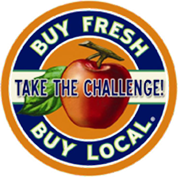 So, support our local farmers and our local economy by taking the Buy Local Challenge. You can participate as little or as much as you’d like–the important thing is to start thinking FRESH, LOCAL, and SEASONALLY when making choices about buying and preparing meals, snacking, and dining out. Join the Challenge by September 30th! If we reach our goal of increasing local purchasing by $200,000, it will generate $300,000 for our local economy. I pledge to spend more on locally grown foods each week throughout the 2016 growing season. How much per week? For how many people are you shopping? Your Buy Local Challenge Pledge has been recorded. We have updated your existing pledge accordingly. Looks like something went wrong, please try again later. Each week, one name will be drawn to win a prize from our local food providers. The sooner you sign up, the more chances you have to win! Prizes and winners will be announced though our various social media channels.